Born with natural abilities in a natural state, for the most part, we begin to adopt to what is normal in our world and slowly reframe our definitions over time. The more we encounter the natural world, the more the natural part of ourselves feels a kinship in remembering and responding. 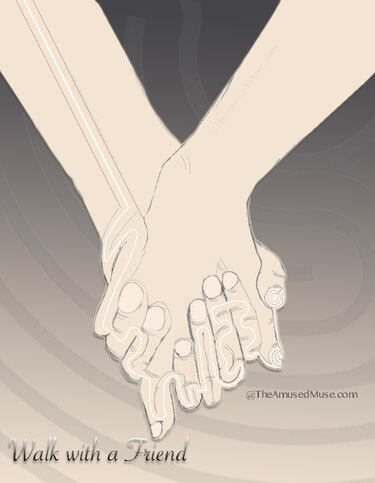 It is simple, raw, pure and innate. 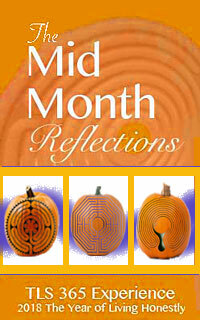 On the labyrinth we can be confused by natural responses that rise and remind while living in a normal world. Natural curiosity calls for us to evolve and create, though as we do stress and resulting illness are the products of what normalcy can do when it steps away from natural. The magic might be expressed in returning to natural while finding ways to remember sustainability with ecology in mind. 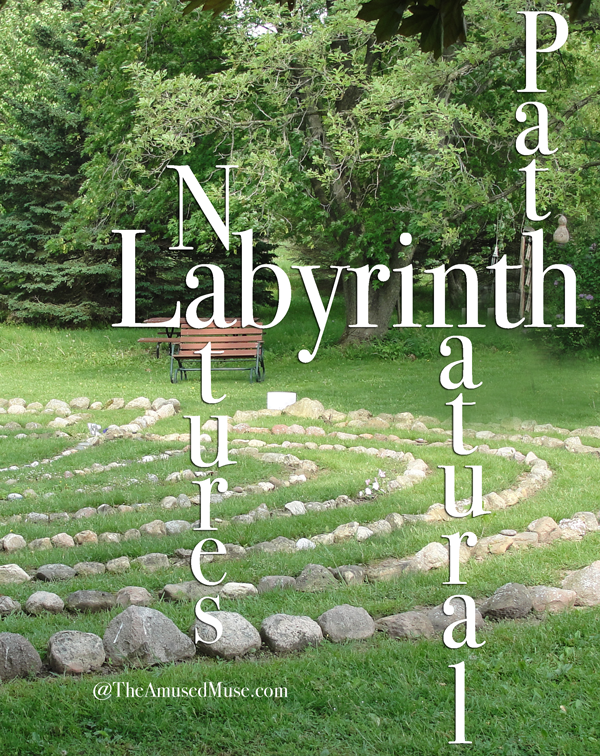 It can be the steps that take us onto a labyrinth that drives water to a necessary irrigation or providing paths for natural peacemaking and remembering. It can be a green entity in urban environs or a reminder of sacred spaces. Allow your past to build a bridge to your future and you will find a natural evolution occurring. In walking, one finds a great rearrangement occurs enabling simple ways to see complex purpose. A venerated space for divinity is the realm of the sacred, a place to allow the presence of our humility in the face of a magnitude we merely understand. To walk in that space it to be willing to take in the moment as a morsel of the limitless availability and apply it with a mountain of meaning. The nature of our reverence grows in our ability to not understand, but to trust and abide in this implicitly. Walking realizations provide expansion from being one person to being one person in the world. In the moment present, walking with any tenacious feeling inward with turning movements of mind and body, a rearrangement from stillness to motion to stillness occurs and changes what’s moved to be moved. In mere steps, what is unsure can become sure and more reverent of the magical change as scared opens wonder of the sacred with respect and reverence. Walking in can move an element into wholly different perspective as one walks out. 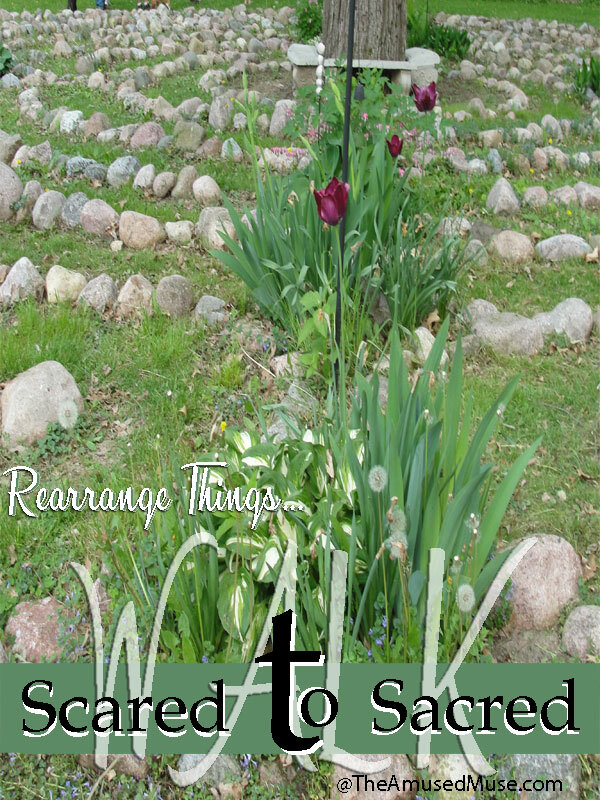 When writing scared instead of sacred, is it a message to trust? Walk in a little unknowing, a little scared to walk out a little more knowing and more reverent for what is sacred. 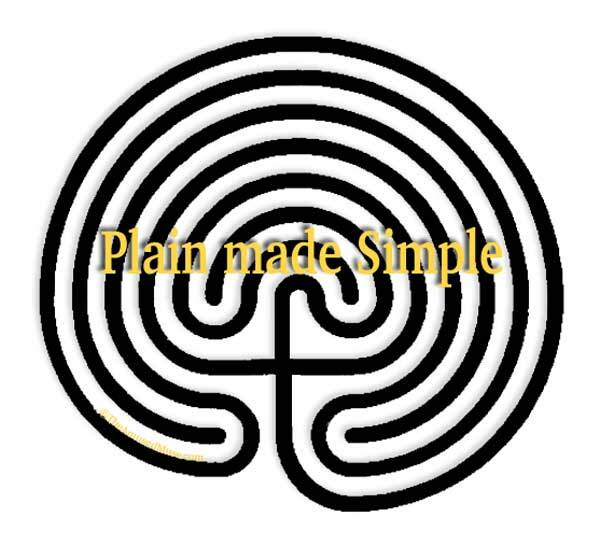 When life gets complicated, the labyrinth offers simplicity at its core. How do we simplify our walk and translate that to our life? Expand on the walk in the ways plain makes simple and how beneficial that might be. Today is a simple practice of walking into the labyrinth noting the things each of us can appreciate, no matter the size or greatness. Upon the realization of the feeling and amount of gratitude in the appreciation, a celebrated feeling can arise. Meeting a friend and walking together today provided many appreciations including, the ease of relating to another with common interest, having a nearby labyrinth to walk, the conversation after the walk, knowing this focus of celebration, enjoying the warmth of the day was yet another and in taking the steps into the labyrinth with these thoughts and more in mind, what arose was a greater realization of appreciation. Such a simple equation to bring cause for daily celebration. The more that build this simple equation for walking in celebration this month, the more there are in the focus of celebration. A simple change that can grow and benefit everyone. Celebrate your observations, participations and activating steps that bring appreciation and realization to simple celebrations. 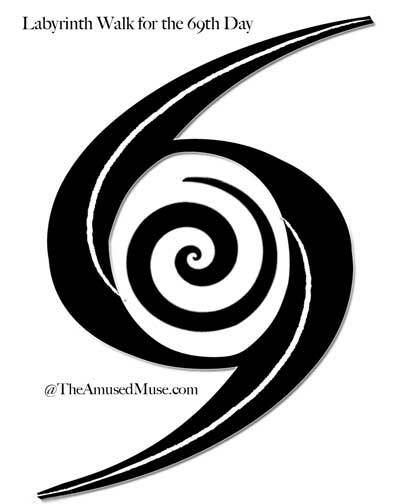 To honor and celebrate the 69th day of the year, the spiral is contained within the overlapping numbers of six and nine that create a natural central space with trailing appendages. The logarithmic spiral is also known as the equiangular or the growth spiral as it demonstrates the capacity to expand and continue infinitely. This spiral was first characterized for its cycling properties by by Rene Descartes in the mid 1600’s. The main difference between the similarly styled Archimedean Spiral and the Logarithmic Spiral is noted by the expansive pathways that grow in wider with each spiral. In the Archimedean design the path widths remain constant in size. Noticing patterns, the six and nines become easy to transpose and design with as they are generally adjustable in usage and offer us the opportunity to be more versatile as well. In the midst of design today, the overlapping number features were an easy design and remind of the simplicity of the lines of the labyrinth. Today’s walk was of the quiet reflective nature, solo and uninterrupted. It called for simplicity and usefulness. 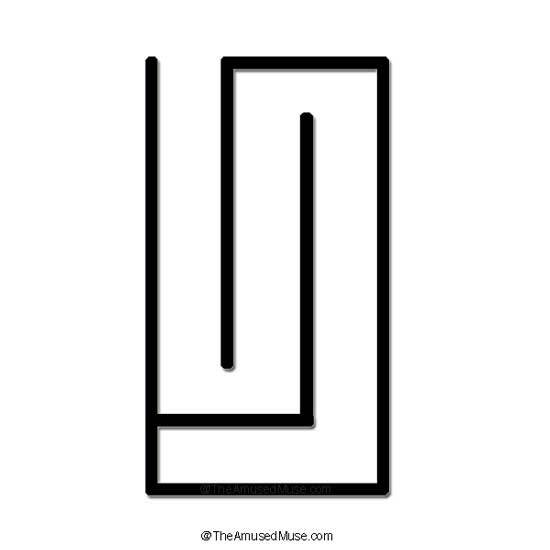 The past days of realizing the varying degrees of the spirals that are present and the nature of the function of the spiral in the labyrinth can be appreciative. A simple way in and out was what called for the walk today, so it was not surprising why this pattern showed up to appreciate the complex growth possible in the Logarithmic Spiral and the easy and simple nature of the number six or nine redefined and designed made sense. It was a balance of universal wonder where complexities walk alongside the powerfully simple. Even in today’s design, it becomes a roadwork of paths to choose the black or the white or both. Walk with the simple graces today and appreciate how expansive they can become, yet humble in their simple design. What finds its way to your path today? It is a blessing and a joy to bring the heart into focus in this walk of possibility we are creating daily in the 365 Experience. 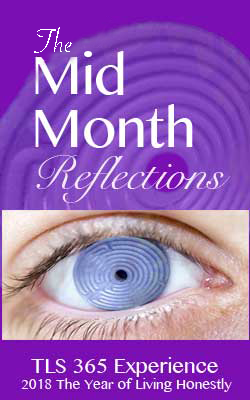 Leading with the heart this month has opened up numerous activities, valuable insights and appreciable gratitude in what can be accomplished in the name of simple honesty. When its not complicated, its value is immense and helps us to realize that potential is an essence of opportunity we can tap into and expand in any moment. 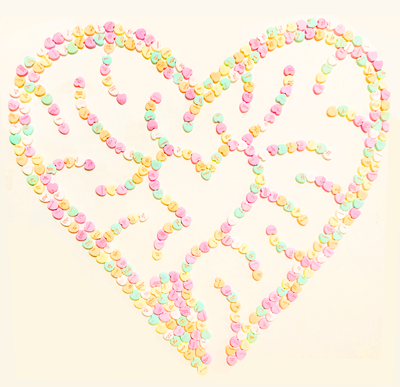 Today with a group of women, the conversation heart took on a new dimension of heart in the pathways of our connection and collaboration. Spreading out the Conversation Hearts, each designed and developed their own independent conversation of what their heart spoke in all honesty. The conversations that came in discussion were wonderfully rich and revealing. Of the three I created, this is the one that I enjoyed the most. Take steps into your heart, stop often, listen intently and continue as your heart speaks. I find the more we practice the more we make the realizations about what is right, what is true and what is aligned with our purpose and beliefs. I got in the habit of creating a short focus of time daily to the labyrinth and that helped me to make more daily habits that support my efforts. It isn’t for everyone, though it works for me and has gotten easier over the past 14 years. When we can set up simpler ideas and have some value behind them, we are more likely to find that it isn’t a goal, or overarching commitment, it is pure enjoyment and something we look forward to discovering. In this practice, its about realizing what else we possess in gifts, talents and abilities and what more we are capable of. Think of it as a daily surprise awaiting as it is more honest approach and much more productive. 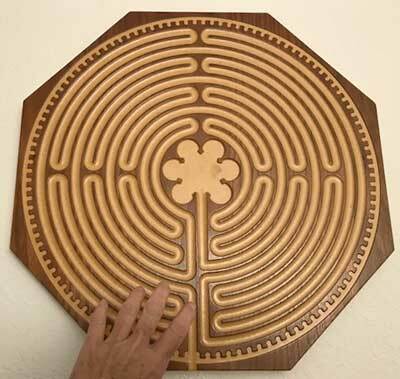 I have a few labyrinths in design hung on the walls and they make for a quick walk while I am waiting for something. The approach is to encounter the experience as something I am looking to realize or discover more than I know right now. It becomes a growing game of what’s next, what’s more and what else I can do or be. When I make the labyrinths easily available, I’m more likely to use them. A picture on the wall, a hanging finger labyrinth, a design on your floor or even just the very small devices left in different rooms can serve us in simple moments of magic. Define more of your moments in this way and notice how much easier it becomes to put value into your schedule for daily discoveries. 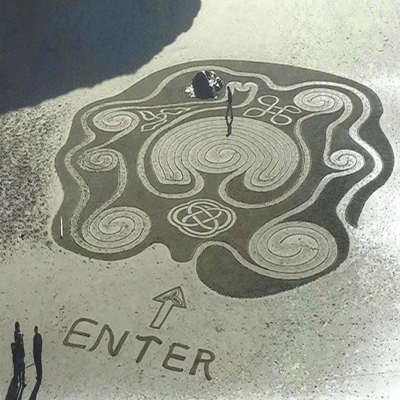 Let’s not forget how easy it is to download a labyrinth walk on a smart phone application. Simplify one important thing today to make it more user friendly.